Bell’s palsy is a sudden or rapid onset facial paralysis or weakness which develops over hours to a day or two. If the face takes longer than 2-3 days to become paralyzed, the disorder is probably not Bell’s palsy and other causes need to be considered. Bell’s palsy, was formerly thought to be idiopathic or without known cause. The consensus now, is that it is a viral neuritis or viral inflammation of the nerve that makes the face to smile. The viruses which can cause viral neuritis likely represent what are called neurotropic or nerve-loving organisms. Among the viruses known to be able to cause acute facial paralysis are Herpes Simplex the fever blister-genital Herpes virus, and Herpes Zoster, the chicken pox-shingles virus. Lyme disease, which is not a virus but a spirochete bacterium, can cause a quite similar disorder. Bell’s palsy is thought to be primarily Herpes Simplex related. The incidence of Bell’s palsy is generally about 20-22 per 100,000 population per year. The rate is highest in pregnant women, a bit over 40 per 100,000 pregnant women per year. The lowest incidence is in children and the best prognosis is in children. About 70% of folks who get Bell’s palsy develop a rapid onset, single sided facial paralysis. About 30% develop diffuse facial weakness on a single side which usually recovers completely within 1-3 weeks. Rarely, does acute viral facial paralysis develop on both sides simultaneously. For a bit over 70%, recovery is back to normal within a month. About half of those who take longer than a month to recover return to completely normal ,and about half have at least some permanent side effects, but, generally, less than 5% have readily noticeable long term facial weakness with other signs of dysfunctional movement. The poorest prognosis applies to the elderly and long term diabetics but all experience at least some recovery of function, almost always quite functional. The repeat facial palsy rate, same or opposite side, is about 6-7% and about 7-10% have a family history of a similar problem. If a repeat Bell’s palsy occurs, the odds of a third recurrence nearly doubles to about 12-15% and if a third palsy occurs, the odds of a fourth palsy exceeds a 20% risk. Most Bell’s palsy patients, have some same-side ear or facial pain with onset of the facial palsy but it may precede the onset of the palsy by up to a few days or may develop after the single-sided facial paralysis. Other associated symptoms include dry eye, eye irritation, blurry vision, taste disturbance, vague numbness just in front of the ear, ringing in the ear, some dizziness or vertigo, and, relatively rarely, hearing loss. Quite similar to Bell’s palsy is Ramsay Hunt syndrome or shingles related facial palsy. Like Bell’s palsy, the facial paralysis onset is rapid but it is typically preceded by painful blisters on the outer ear or on the ear canal back wall. Pain with Ramsay Hunt syndrome is typical of shingles and may precede the paralysis by up to a week and rarely occurs without blisters (sine vesicles). Untreated, the prognosis for Ramsay Hunt syndrome is much worse than for Bell’s palsy with well over 50% suffering from permanent residual weakness and some having a permanently complete paralysis on one side of the face. Aggressive, early treatment lowers the bad-outcome risk…see treatment below. The mechanism by which the face becomes paralyzed in Bell’s Palsy involves several factors. First, the causative virus must exist within the nerve that makes the face to smile, the facial nerve. For the virus to get to the nerve, the person likely will have contracted the virus from another person by sharing forks or other food implements or by other intimate contact with a person who was actively shedding virus. It is not generally contagious by simply being in the same room. From initial contact, the virus multiplies and causes at least a localized skin or mucous membrane infection. In some folks, the virus may spread via the blood stream or through nerves to infect nerves at distant parts of the body. From that initial infection, the body develops immunity which generally keeps the virus under control or dormant but the immune system is generally not capable of ridding all of the nerve cells of dormant virus. Recent research suggests that immunologic mechanisms exist which do suppress the virus living within the nerve cells. Later, something happens which appears to ratchet back these immunologic control systems, allowing the dormant virus to replicate and make the nerve sick. A sick nerve becomes dysfunctional and swells. In the case of the facial nerve, an additional factor is the bony channel which it runs through to get to the face. As the facial nerve exits the brainstem, it is adjacent to the hearing and balance nerve as well as one of the taste nerves, the nervus intermedius. The latter is also the nerve which controls nose moisture and formation of tears for the eye. Where these nerves are together in the internal ear canal, they float in cerebrospinal fluid. At the lateral end of the internal ear canal, the hearing and balance nerves enter the inner ear, but the facial nerve and the nervus intermedius join together to course just above the inner ear. At this location, there are at least two nerve junction and cell body or ganglion areas. The one considered most likely the source of critical swelling is the ganglion of the meatal foramen. In this region of the facial nerve, a leathery brain covering wraps the nerve pretty tightly to prevent spinal fluid from leaking out along the nerve. The tightly wrapped nerve then enters the bony nerve canal which is barely large enough for a not-swollen nerve. Anatomic research suggests that the tighter this bony canal is, the less it allows a nerve to swell without compromising its function. In children, the bony canal is larger relative to nerve size than in adults. In some adults, the nerve just barely fits into the bony canal, leaving no room to tolerate nerve swelling during a viral nerve inflammation. Thus, in order to get Bells’ palsy, one must already have virus in the nerve, one must suffer some event that lowers immunity, and one must have anatomy which is too tight to allow the nerve to swell. In pregnancy, the natural tendency to retain fluid makes this situation more difficult. Bell’s palsy is not a stroke. Strokes rarely look quite like a Bell’s palsy. Generally, in Bell’s palsy, not just the lower to mid face is paralyzed on one side, but the forehead is as well. In a stroke-associated facial palsy, the forehead generally is still active. This is called forehead sparing. Such a stroke comes from the opposite side of the brain. The sparing occurs because some forehead nerve fibers come from the same side of the brain or do not crossover. 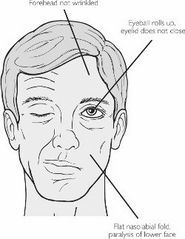 It is theoretically possible for a rare tiny stroke in the brainstem to cause isolated facial palsy which looks exactly like Bell’s palsy but associated features such as pain would likely be quite different. Lyme disease, caused by the spirochete bacteria, Borrelia Borgdoferi, can cause facial paralysis that looks indistinguishable from viral Bell’s palsy, other than that pain seems less likely. This particular organism is transmitted by the deer tick and is not endemic or does not exist in mid to South Florida. Along the entire Gulf of Mexico coastline, a Lone-Star Texas tick may transmit a similar spirochete capable of doing the same. The same blood tests for Lyme disease are positive in both cases but Lyme disease facial paralysis is quite rare in those who have not been out of Florida in the spring to early summer when the nymph deer ticks are most likely to infect folks. In Lyme disease, the facial paralysis may occur at virtually any future date, but generally does so within a few seasons of the initial contact. Facial palsy from Lyme disease appears more likely to affect both sides of the face and is more common in children. Many other disease processes can cause facial paralysis but the vast majority of such palsies develop more slowly than does Bell’s palsy. Among the more critical to recognize are ear infection related facial palsy. The latter is more common in children more prone to acute middle ear infection, but may also occur at any age with a specific ear problem called infected cholesteatoma. A variety of tumors can also cause facial paralysis, generally taking 4 or more days to develop. Another rare, sometimes relapsing problem is called Melkerson-Rosenthal syndrome. In this disorder, along with facial paralysis, the patient also develops a swollen, coated tongue at the onset of the Palsy and typically swelling in the face. This disorder may be recurring as well. The natural history of straight forward Bell’s palsy, untreated, is that all, yes all, recover at least to some degree, regardless of age. The incidence of recovery back to normal is about 70%. Residual facial weakness that is noticeable, to at least a minimal degree, is present in about 20-25%. Moderate to very noticeable residual facial weakness is much less common, generally affecting under 5% of folks under age 60 but a bit more common in the elderly, diabetics, and those affected during pregnancy. When residual weakness accompanying facial recovery, facial dyscoordination is also commonly present. For example, an effort to smile may cause the eye to close. Attempting to pucker may cause the smile-fold (nasolabial fold) at the corner of the mouth to deepen and the eye to close. Synkinesis is the term for this type of dysfunction. Commonly, synkinesis is also accompanied by weaker forehead recovery, as well as decreased ability to raise the eyebrow and a degree of eye dryness. With synkinesis, some develop large tears called crocodile tears while eating or talking as some of the nerve fibers intended for the facial muscles or the saliva glands in or below the mouth may be redirected to the eye tear gland. The natural rate of recovery generally starts within 3 weeks in 70-85% of patients. The longer it takes for recovery to begin, the more likely are the problems like incomplete recovery and synkinesis. Recovery always starts no later than 6 months after onset. If recovery has not started by 6 months, the problem is not Bell’s palsy. Recovery is at first subtle, but the rate of improvement speeds up and is generally complete within days to a very few weeks if it starts early. The longer the recovery waits to start, the slower the recovery, but the vast majority of recovery happens within 3 months of the first signs of recovery. Some additional improvement may occur over an additional 3 months, perhaps as long as a year or more. Risks related to facial palsy: The major risk during facial paralysis is failure to lubricate or protect the eye with eyelid closure. Lack of tears and failure of eyelid closure may lead to corneal abrasions which can lead to permanently impaired vision. Sometimes, a corneal transplant can repair the vision but not always. Thus, protecting the eye is the most important aspect of managing a facial paralysis. In Bell’s palsy, appropriately aggressive treatment involves use of high dose steroids, generally 1 milligram of prednisone per kilogram of body weight, daily. Quite a number of research papers support the opinion that early steroids decrease pain and lessen the risk of major residual facial palsy. But, remember that at least 70% recover to normal with no treatment and only about 10-15% have moderate to major residual impaired dysfunction with no treatment. It appears that the severity of residual dysfunction can be lowered by early, high dose steroids. The earlier that they are started, the better, ideally within hours of disease onset. The natural tissue disease process causes the swelling to abate within about two weeks. Starting steroids that late is of doubtful benefit and continuing high dose steroids longer than 12-14 days after onset is probably not beneficial. Some propose adding antiviral drugs at the initiation of steroids for Bell’s palsy. At most, a small additional benefit accrues with the addition of drugs like valacyclovir (Valtrex) or its cousins, acyclovir or famciclovir. While the evidence that steroids are beneficial is fairly strong, the evidence that anti-Herpes medicine is helpful is less convincing, but it is common practice. However, in the case of Ramsay Hunt syndrome, a facial palsy caused by the shingles-Zoster-chicken pox virus, the use of early, very high dose antiviral therapy is associated with a markedly improved outcome. Whereas the vast majority of Bell’s palsy patients have quite good recovery, poor quality facial recovery in Ramsay Hunt may occur in up to 80% of untreated persons. For Ramsay Hunt patients, the poor quality recovery rate can drop to quite similar to Bell’s palsy if they are treated early high dose steroids and high dose antiviral medication. In Ramsay Hunt syndrome, a troubling but quite infrequent complication is permanent complete single-sided facial paralysis. Preventing it with early aggressive medication is strongly encouraged. Unlike Bell’s palsy, the swollen tissue takes longer to subside, perhaps longer than 20-21 days, and the permanent nerve injury risk is higher. Surgery may be appropriate for a very limited number of folks who develop acute single-sided facial palsy. When the facial paralysis is severe, with no apparent motion, an electromyogram or electroneurogram electrically stimulates the nerve. If the nerve remains able to be stimulated at four or more days after onset, the probability of spontaneous high quality recovery of function without surgery is very high. When the ability to stimulate the nerve is more than 95% lost and no voluntary effort is recordable electrically, the odds of a poor quality recovery may exceed 50%. That testing is only valid if done between days 4 and 14. If at that point, urgent surgery removes the bone that is constricting a swollen nerve, the odds of high quality recovery improve to over 85% but the surgery must be done before the 15th day, if it is to be done at all. Doing the surgery later than this does not improve outcome and we prefer if at all possible to do the surgery before day 12-13 as the probability of benefit seems to decline beyond day 12 of the illness. The surgery is called middle fossa facial nerve decompression. An incision is made from just in front of the ear directed upwards about 7-8 centimeters, or about 3-3.5 inches, exposing the underlying muscle. After mobilizing the muscle, the surgeon opens a window in the skull measuring about 3.5 centimeters square, exposing the leathery brain covering called dura mater. The surgery purposely stays out of the brain but does elevate the dura from where it overlies the top of the inner ear. Between the hearing and balance organ, the surgeon uses fine diamond burrs to sand away a channel in bone until the internal ear canal and the facial nerve are reached. Opening the bony canal of the facial nerve removes the tight constriction of bone around the inflamed nerve, allowing it to swell. A swollen nerve constricted in the tight bony canal loses its blood supply. By allowing it to swell, the blood circulation to the nerve recovers and the nerve is more likely to recover. The surgeon replaces the bone window in the skull with titanium plates and puts the muscle back. After closing the skin, the surgical team covers the incision with a dressing and sends the patient to recover overnight in the intensive care unit. Most patients go home after 1-2 days in the hospital. Risks include leakage of spinal fluid, decreased hearing, dizziness, and bleeding inside the head, all pretty rare. Infection is rare and failure of the facial nerve to recover is possible. For those who have recurring Bell’s palsies, middle fossa facial nerve decompression stops the recurring paralysis but not the recurring viral nerve infections. The recurring viral nerve infections are thought to be equal to recurring fever blisters or recurring shingles. The surgery allows space for the nerve to swell when the virus affects it, typically not bad enough to cause paralysis. Our local experience with quite a few of these patients which indicates that long term antiviral medication prevents the recurring palsies, without the need for surgery. However, long term antivirals are preventive and do not have more than a minor affect on recovery of the acute palsy. ie., these medications do not remove the potential need to decompress a nerve that meets decompression criteria. For those with Ramsay Hunt syndrome, (shingles associated facial paralysis), our preference is early, very high dose antiviral medication and high dose steroids, continuing both until at least the 21st day after disorder onset. While the published literature suggests that middle fossa facial nerve decompression is effective for Bell’s palsy, the question of adequacy of benefit from surgery has not been proven in Ramsay Hunt syndrome. Nevertheless, since nerve swelling seems to be the in-common issue that causes poor quality recovery, many think surgery is indicated for severe Ramsay Hunt facial paralysis. In summary, Bell’s palsy can be a quite disfiguring disorder, but fortunately, for the vast majority, high quality recovery occurs within weeks. For those with delayed recovery, satisfactory function is highly likely but some degree of impairment, generally not severe, may remain. For those whose prognosis for a poor quality recovery seems high, surgery is a possibility. When facial paralysis features do not fit well with the classic features of Bell’s palsy or Ramsay Hunt syndrome, a careful evaluation for other causes is essential, as other very serious issues may exist for which other specific management is appropriate.